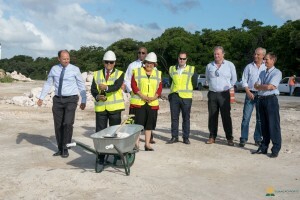 WILLEMSTAD - The Minister of Economic Developments, Mr. Eugene Rhuggenaath and Minister of Traffic, Transport and Spatial Planning, Mrs. Suzanne Camelia-Römer had the honor to do the groundbreaking at the construction site for the second ‘Mega Pier’, Tula. During the groundbreaking ceremony, Minister Rhuggenaath emphasized the importance of teamwork. Minister Rhuggenaath also mentioned that Curaçao Ports Authority (CPA) has many plans in development, not only for our maritime activities such as the cruise and yachting sector but also for downtown Willemstad. Chief Operations Officer (COO) of CPA, Mr. Albert Zwueste gave a brief overview of the project and is satisfied that construction has finally started. Below some pictures of the groundbreaking ceremony.